This marvelous adventure was a chance encounter we literally stumbled upon–a totally unplanned departure from the itinerary. But when it was posted and offered, we jumped on the bandwagon, or van, as the case was, and joined the crowd to take part in the annual release of tortuga turtles. As fascinating as this whole event was, it may have even been more awe-inspiring had we understood Spanish, since the entire process was given in a step-by-step explanation. Still, we gringos got the basic gist of the idea via body language, signs, and astute visual learning. U.S. Aid helped sponsor this particular event. (That much we COULD read on the sign.) 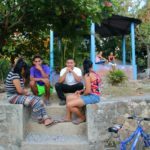 They, as well as other ecological groups, are encouraging cooperation throughout the Caribbean and Central American countries with Pacific coastlines to help protect the endangered Tortuga sea turtles. Incredibly the female turtles, that were born on this exact same beach, return from a migration journey which could be up to thousands of kilometers away to lay their eggs on the same site 11-30 years later between August and December. Laying their eggs is the only reason that a female sea turtle returns to land. Community volunteers collect the eggs and re-nest them in more protected areas away from predators, sometimes in incubation hatcheries. When the eggs hatch 45 days later, the locals who have been vigilantly monitoring them around the clock throughout the incubation period hold a big celebration to release them back to the sea. On the day of release, there was an orientation process which began with our signing ourselves in via a “guest book,” to educate us participants. The persons in charge then showed the enclosed area where the eggs had been kept; this consisted of various pits dug deeply into the sand. One pit was uncovered of its camouflaged palm fronds to disclose its depth and size. All pits were plotted off and carefully marked with the number of eggs in each pit. In this specific area of the beach that we worked in, there were 475 hatchlings being released. 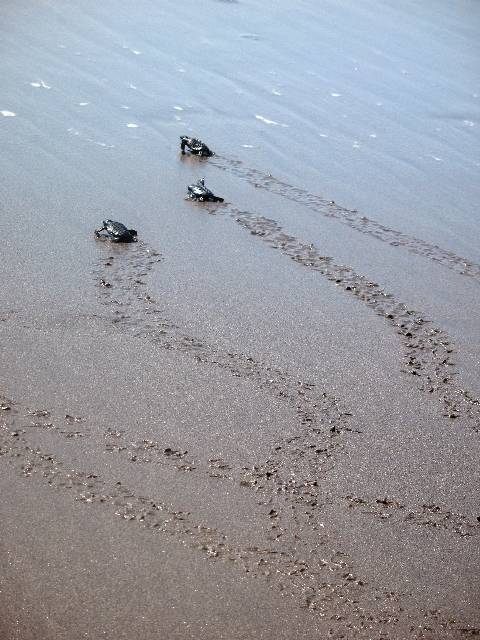 Along the coast in El Salvador during this time frame, the officials estimated 15,000 baby turtles were journeying to the sea. It’s hard to say which was more eager for the end result – those tiny, squirming, little flapping turtles whose flippers were larger than their bodies, about the size of a large chicken egg, swimming around in the large metal tubs eagerly trying to scratch their way up the sides of the tub to seek freedom and reach their destination – the sea or we the participants who were eager to get our hands on their leathery little bodies. The excitement building, we watched a man proceed toward the beach with a long stick that he used to draw a straight line in the sand a bit closer to the water. Several people then carried the large metal tubs filled with the turtle hatchlings out to the beach and placed them at 20 -foot intervals along that line. We were instructed to divide up in groups of 15 around each tub of turtles. The adult in charge of each tub gave us instructions on how to carefully handle the fragile turtles and place them along the line. It had the appearance of a long turtle race. There were two armed guards – one at each end of the beach. 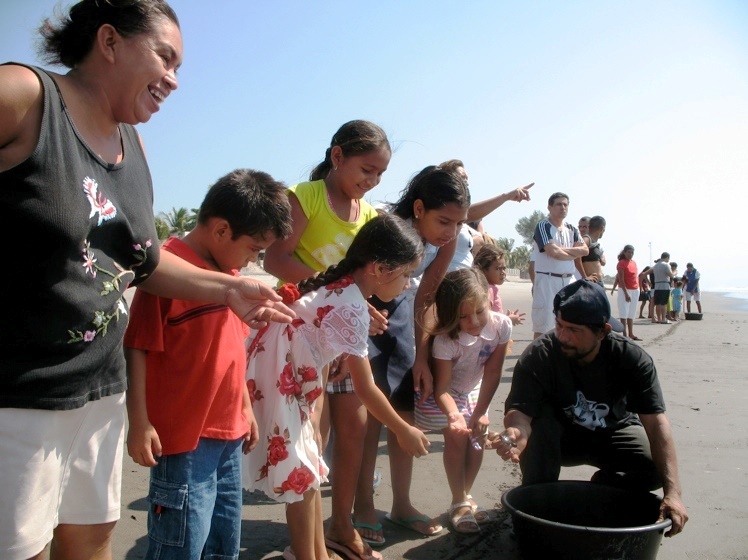 That struck me as odd, but in El Salvador you see armed guards everywhere so why not at a turtle release? Each person was very careful and respectful, taking his or her turn. We each cheered on one another’s little turtle to its seaward path. They needed no urging or aim; these little fellas knew instinctively to follow the sea mist. A rumor circulating at water’s edge was that the mother turtles were out there in the surf awaiting their little hatchlings to join them. As romantic a notion as the rumor was, the details were not verified by a turtle expert back home. Oh well, I still like the thought that it could be possible. After each person had a turn, with remaining turtles still in the tubs second turns were permitted, and the consensus at our tub was the children should get second chances before the adults. We turned our heads the other way to the occasional wayward seagull swooping down in search of a snack. Statistics are unfavorable for survival for many of these tiny creatures, unfortunately. This process went on for several hours. I don’t remember even noticing the intense heat of the day out there along the water’s edge. I was so caught up in the excitement and the certainty that MY little fellas were sure to be the ones to survive and return here in another 22-36 years when they reach sexual maturity to lay their eggs for someone else — or maybe me – to release their eggs and thus be part of witnessing nature’s predictable life cycle once again. At its conclusion there was a joyful celebration back where we had begun our orientation under the shade of palm trees. Coolers were opened, and baggies of coconut milk, sodas, and ice cream vendors were on hand. Our offers to pay for the treats were refused. I’ve since read that other countries promote and advertise these events as eco-tourism friendly and charge admission for the privilege to participate. This is in total contradiction to the event I just described. It was low-key, free, and open to anyone. The fact that it was conducted in such a very friendly, welcoming, inclusive environment speaks volumes of the gracious Salvadoran people. The value they place on the sense of community is central in their culture.